Wheat is flowering and kernels are starting to develop pushing into the milk stage. Most of the crop has been sprayed with a fungicide to protect from rust. April sprays should hold us out until harvest. Decatur County Agent, Justin Ballew, located wheat stem maggot in a field there. I have not seen or heard reports here. 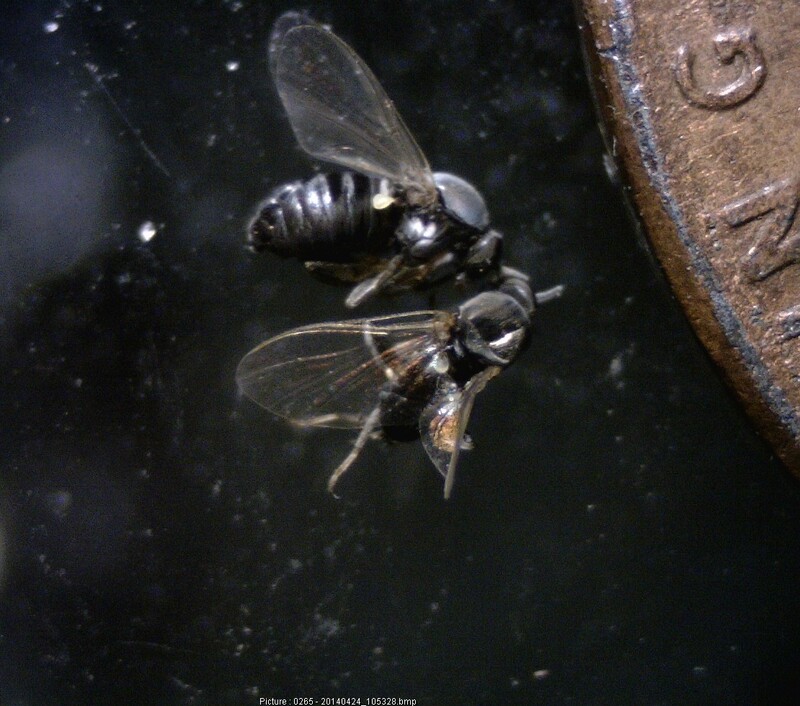 The maggot apparently bores into the stem at the bottom of the top internode and the grain head dies and turns white. UGA Extension Entomologist, Dr. David Buntin, says he has seen it before and usually at low levels in the field such as these. Below are two pictures from Seminole County Agent, Rome Ethredge. For now we can still check for ahpids. Our threshold from heading to early dough stage is 10 aphids per head. Once the plant has lost its green color and we hit the hard dough stage, insect and disease management is ended. Aphids were not a problem in this field here, but I did see a hatch out. Something I’ve seen all season is good beneficial population. Here is a picture of a lady bug larvae (left) and some adult, baby, and mummy aphid on leaf (right). “These are black flies. They are native to Georgia and we have several different species. This one will die out when the weather warms, but we’ll have another resurgence of a different species in the fall. They love to feed in horses’ ears and will leave them bloody and scabby. They’re being produced in flowing streams, probably half a mile away from where the horses are (or more). Area control is possible with Bti, but that’s a governmental decision, not something the individual horse owner can undertake. Here is Joseph Matthews putting out fungicide. Before the trees bud out, they can spray every other row since mist will travel through limbs. Everything has come out pretty good except for Stuarts and Sumners, so they will have to go down each row. So much rain in the past few weeks is forcing everyone to get off to a good start with fungicides. With warm days and cool nights, we are beginning to see turfgrass diseases like this I found yesterday. I was able to look at some centipede turfgrass under the microscope and confirmed it to be Large/Brown Patch (below). Rhizoctonia produces distinct mycelia with three characteristics for diagnostics: 1) septate hyphae that branch at 90 degree angles, 2) constrictions at the base of the branching, and is 3) tan to light brown color. Large/Brown Patch will infect in the Fall and Spring when temperatures reach over 80 degrees during the day and stay above 60 degrees at night. During the summer, I commonly find Take-All Patch which can really cause problems. Use low to moderate amounts of nitrogen, moderate amounts of phosphorous and moderate to high amounts of potash. Avoid nitrogen applications when the disease is active. Increase the height of cut. Minimize the amount of shade. Irrigate turf early in the day. Improve the drainage of the turf. Remove dew from turf early in the day. Fungicides are available to control the disease. Consult the 2014 UGA Georgia Pest Management Handbook. Centipedegrass also succumbs to an environmental disordered termed “Centipede Decline.” Dead patches can be caused by this where centipede has been stressed and over-fertilized/managed. It is good to avoid weed control during green up. Make sure not to fertilize too early – generally late April/Early May is good fertilizing timing. Centipede does not like more than 1 lb of nitrogen/1000 sq ft in a season, so do not over-fertilize. Here is a link to the Turfgrass Diseases in Georgia: Identification and Control. A) Primary burndown herbicides will either be glyphosate or paraquat. As we get closer to planting, paraquat might be preferred if a quicker burndown is needed. FirstShot (0.5-0.8 oz/A) – will also help improve the control of radish and primrose. May also be useful in fields were off-target movement of 2,4-D is a concern. Peanut plant-back restriction for FirstShot is 30 days. Aim or ET (1-2 oz/A) – either one of these herbicides can be useful in preplant burndown situations where annual morningglory plants (except smallflower) have already emerged. Aim can be applied anytime preplant up until 24 hours after planting. ET can be applied anytime preplant but before peanut emergence. C) Growers who want to get early residual control of pigweed, especially when there is a potential long delay between application and planting, may want to include Dual Magnum (16 oz/A), Warrant (48 oz/A) or Valor (2 oz/A) in the burndown. If Valor is used in the preplant burndown at least 30 DBP, an additional 2 oz/A can be used PRE after planting. Valor will also help improve the POST control of radish and primrose (+10-15%). I must admit that I would prefer either Dual or Warrant for residual control in this situation to help protect Valor from potential resistance issues. There are no peanut plant-back restrictions for Dual or Warrant. Many pecan orchards have received their first fungicide spray of the season. Many are starting with a spray of Absolute and sometimes mixing that with another. Weed control and some fertilizing is still going on. Mowing has also started up, although the rain has slowed it all down. I looked at this orchard today before the storm came in. Most Desirables here are popping out. They will be a few days ahead of the Stuarts. Above is a picture of catkins coming out. They bear the male flowers. UGA Extension Pecan Horticulturalist, Dr. Lenny Wells says the catkins coming out is a good sign. “Although catkins don’t guarantee a good crop of female flowers, a good catkin crop is usually associated with a good female flower crop.” We should see our Female flowers in another couple of weeks. Dr. Wells says female flowers (pistillate flowers) are actually induced in August but not detectable until the next spring. This means the current year’s crops was largely determined during the previous growing season. Female flowers will form on the spikes at the tips of new branches. This orchard did pretty well last year managing scab disease. Still, the disease hurt Thomas County and the rest of the state last season with the rain. 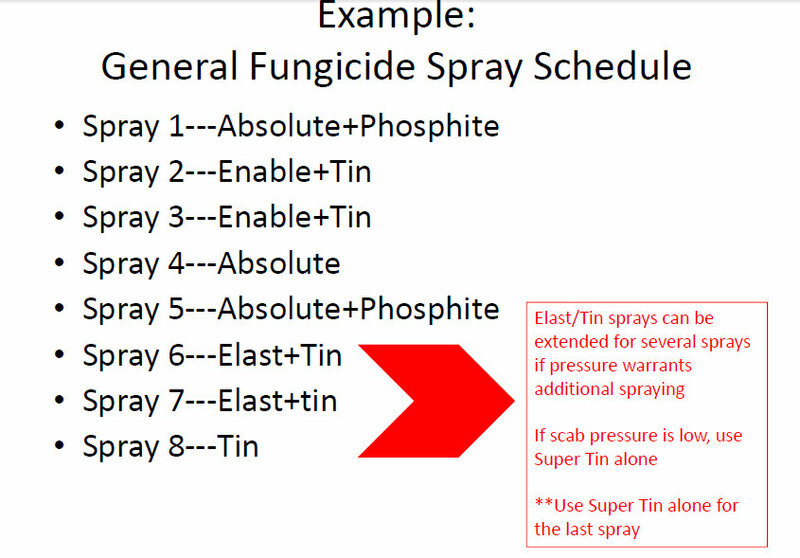 Here is a link to the 2014 UGA Pecan Spray Guide.